Rishi Persad presents live coverage of the World Indoor Singles Final from the Potters Leisure Resort in Norfolk. With commentary by David Corkill. Browse content similar to Singles Final. Check below for episodes and series from the same categories and more! # I'm only human after all # Don't put the blame on me #. # Don't put the blame on me # Don't put your blame on me #. of commentating on playing, how important, how significant is today? as you have a chance to become world champion. and we will play from scratch and play our hearts out. afternoon, if not, I'll be back again next year to try again. it's not even like I've chosen a different shot. up, I'm going to play a forehand runner. Why wouldn't you? moment, the last bowl finish in the second round against James Rippy. to move it. It was a fluke, he put his hand up and that fair enough. also, it's his fifth time. I think I have to go for him. game, ladies and gentlemen, your appreciation for Paul Foster, MBE. gentlemen, the world number four, it is Greg Harlow! sport. Andy Thompson is in the commentary box alongside Corky. COMMENTATOR: Thank you, that 200 yard dash gets longer every time. previous one but you are doing fine. They're working you had. is very, very good when he gets to this stage. of in a world singles final. Half an inch, half an inch. singles game. Talented players who play all the shots. meant to be behind. Still not running. If he misses that he's in position for the push shot. Two, red. That was a good waiting ball for Paul. reduction of shots. Two down and reduced it to one. He will be happy. to their right to the wire. Greg's opening balls have been very good. well. Just dropping a little bit shorter. Need a correction with the second bowl. Draws the winner. jack, as well and still holds onto two. just to make sure he doesn't tap the bowl on the jack. Changing to the backhand side. Unlucky to give the shot away. big-time, aren't they? 72, that's a big increase. Good luck to them all. start losing a big count. He's on a perfect line, it's all about weight. there. This will be a loose four for Paul Foster to drop. away with that. Paul isn't getting away with it, he's losing four. APPLAUSE His wife, delighted with that. An excellent four. 5-2 after three ends. APPLAUSE Once again finding the middle path. but does have a tendency to change a little bit in pace. baffled by this slower side. This looks like the shot bowl coming in. As you say, finishing in the centre, just short on pace on this side. shot well. Time out called. I thought he was going to use a time out there. ball. There is a danger but I think he may have two seconds. move the jack or move to the forehand? Two 11-end sets with a three-end tie-break at the end if we need it. Players have 30 seconds to play their bowl after the first bowl. First bowl of the end there is no clock. start of the season, in September but outdoor clubs do it, too. bowls, all of a sudden he is two down. Good recovery. Second bowl. ! an exhibition on in one of his games He certainly did against Niki Brett. He was outstanding. Paul still trying to draw here. Well, that's another second, so he will be happy with that. Well-played. Keeps advantage. It certainly did. point of the first set. Good bowling but not absolutely outstanding yet. from that and this one will be threw. jack, then he is really in the driving seat. playing for the safe bowl. We did indicate a back one would be useful. is on a good line, it is all about the weight. Will it bend in time? this time. Still short but different lines. to agree with you as well. This is a good recovery. Well-played. times but it looks like the forehand runner. think it was the bowl going through the gap was the problem for Paul. got the maximum result with both of them. You can't fault the shot. a double here. Oh, struggling to get back. It is good enough, I think. just putting them close and hoping that Greg misses. little bit of movement. I think it is the way he polished that bowl. Getting himself reset again. No time clock on the first delivery. some music prior to the final. I saw you singing away there, David. I think I was in a meeting at the time! he needs to. Ye, Paul won't be unhappy with the way he is playing. Sometimes you can't do much about it if the opposition play big bowls. choice. Red bowl was the number one target but catches his own bowl. Third bowl, moves the jack, scores the shot. Well, something is not right with this. But he is not too far away. Oh, he is very close. He is very close. Oh, that's a great bowl. read it well. Lots of chances. The ball was good, the jack was good. key, David. No target at the moment here for Greg. this on the other side. Two-and-a-half inches, one green. Your bowl is half an inch short of jack high. suggested, David, change the hand, forehand, put a position bowl in. Andy, the backhand to get into that, force the red bowl through the head. he is taking the first option. Playing the position bowl. defensive here, he won't be attacking this, backhand draw. result. If he misses it he might come into position He is playing it. heavy. I wonder if Greg will take a risk? I don't think he needs to. target. That was the key there, really. doesn't really go fast but he's always in control of the delivery. that the ball wentp against the bias. This is just a backhand draw. four, that was the difference. Paul already turning his back on that. point rumour -- 2.3, compared to 1.2 from Paul Foster, good statistic. Quite a big distance, 2.3 to 1.2, almost double, isn't it? Yeah. three or four feet away. Just holds out. Lovely, lovely you Waites. balls. That was enough. I agree. I think Paul has played quite well. the maximum. Good bowling over that distance. Foster. Yes, this ball finishes on the top and Paul is in trouble here. bowl onto front bowl also gives him something. Calling for a time-out. Paul Foster. Greg need another one in. -- a decent read whole. catches that, the two red would properly go out the head. get the red bowl on the follow-through. toucher. That was a mistake, basically, that was a mistake. Someone tweeted saying was that a toucher, it wasn't, but that was. front bowl went straight into the ditch. great, great strike again. Brilliant striker. he? He does not miss on that forehand, he gets them all the time. trouble. Paul Foster will continue to draw. This is where Greg is good. He's played a running bowl back to the draw, he is liable to draw this. Many years ago I saw Greg do this into the international Welsh open. playing well, not nearly as well as he is here, but he won the match. Yes. That's great bowling from Greg. He will be delighted with that. Foster, a very, very hard-fought single. 0- two after two ends. be expected in a Scotland- England game. Yes, he lives not far away as well, so that helps. had the bigger support that day, obviously, playing in Scotland. there is room around the bowl but going back to the backhand side. been an awful lot better. As it is, nothing close. running bowl. He's got this all the way. but the reaction was very much there. be aware of that. Starting to get closer. the best venue in the world to play bowls. You just can't beat it. will get back. Always looked slightly wide. Now, Paul, you want to be just a little careful here. Gentle, gentle. second. He's going for a single bowl target here. Surely not a result. absolutely bounced the bowl but the run-through, Andy... Watch this. Catches it perfectly, the green bowl pushes the read what -- red one. outcome favour of Greg. A spectator came in there and put Paul off. words. He must miss something. It's not the missing, it's the results. aiming for, anything between the jack and the red bowl would be good. The audience applauding that bowl, anything that went past was good. position to stop the jack going past it, as well. I think we will see Paul changing his hands now. Forehand draw. to draw on the forehand, but it is definitely not easy. he's shaping up for a forehand draw, I think. shot to play. I think it was, but a harder shot. that they have to go out occasionally. were, absolutely. Two hours before kick off. inches short of jack high. Backhand draw, trying to get one close. Greg can afford to reach this. Definitely. Catches the green bowl. It'll gout and lie one or two. To the jack, three inches. happens if Greg hits this target. I still think he needs another one in. enough, if both the bowls are removed. jack and all the way through. Well, Paul must have first and third here. can not hit every target. Nobody does. it's fallen over. Inch-and-a-half short. always know. Shot bowl coming in from Greg. Doesn't want to move P the jack too much but he is right in behind it. Snr single bowl targeted. I don't think Paul Foster will go for that. Two red. Two red. Still the backhand draw for Paul. there. For his case, I think it looks like forehand g for position. short red bowl. Red bowl into the jack, looks like three or four. Looks like backhand but playing on his favoured forehand. Will he bend? is starting to put close bowls n asking a lot of questions of Greg. not given but Two green. Seven inches from jack high. A short one? are definitely going into a tie-break. tie-break yet but both players are awhich are it is coming shortly. first set and he carried that all the way through. Scottish hard happy with that. They see their man taking control here. drawing, knowing that this set is almost certainly gone. Muralitharan there for one within six inches. -- a little murmur. pressure Played really well Paul Foster. bowl. Off we go, three-end tie-break, the rules change. this professional calendar they don't, and that keeps it exciting. Paul, going very short with this one. Thornhill. He's been around the world. Yes, they do a wonderful job. shot here. Pushing the bowl up. It is, he is better. smooth. How is the running Greg, I don't think you are running. whizz it in, there is no real problem. He's got two shots against him. He can not drive the two of them. weight, from Greg's point of view, has just gone off. he will be delighted for his pairs partner here, in the driving seat. this shot. Try one attempt anyway at forehand draw. past is good. Right Greg, decision time, bowl-to-bowl or forehand draw. confidence thinking - if I catch this bowl good, the green goes out. side of the screen, I think if Paul beats that, I think that's good. hits it solid on to the jack and it'll go to the other red bowl. what he has been looking for and he has done it. And he played well. half of the game but well done, Paul Foster, delighted for you. 2-0 in the tie-break. Paul Foster coming out looking relaxed. up the shots here and there. That was a beauty. But it was Paul Foster who came back very, very strong. And missed a chance in the first end of the tie-break. Of a loose draw. event and go the better with every match. So ends won, Paul Foster, well, 16-6. That was very comprehensive. runner-up, but ladies and gentlemen, your champion, Paul Foster! with the group marketing and distributing manager, Mr Cooper. the things Greg Harlow has done well all week is the forehand runner. more, in Paul Foster. I don't think he's chasing Alex, I really don't. is telling the world number one he needs glasses at measures! the 2016 result in the ladies competition. And nor in the men's. rights to it to Paul, commiserations to Greg. There's always next year. We are looking forward to champion. indoor Les Gillett and Jason Greenslade the winners of title. hard. You looking for the pressure bowl, the bowl you have to make. This was the seal the match. He had to seal the match. He had nowhere. Through the shot. Absolutely brilliant. That took him through. was Charlie Bent, at the age of 71. He got a standing ovation after his. one that touch the heart most of all was Charlie Bent, at the age of 71.
be a national star. Can you imagine when he went back to his own club? well. Here it's different. A very limited field. Very high quality. leads 6-5 hours we join it in the second set. Keeping in this set, trying to force the tie-break. think she can pop one round her own with an extra three feet of running. We'll be very close to this. -- will be. One red. Good bowl, now she can attack it. Martin Puckett really needs to win this end. Yes, can't afford to lose a shot here, pushes the bowl up, I'm lucky. drop in. Still one red but still a very good bowl. good result off the green bowls. Unlucky, very unlucky. the forehand. A very aggressive player, we've seen that already. bit noisy. He's a quiet lad! I am sure Perry will be watching now. has been playing you would expect her to correct with this one. Good match, disk. Going on for an hour and a half. Good quality. quickly on the mark. That was fast, Andy. It was just a draw. Good line. very well played. Still got to be careful, only one down. could be a bad result for Ellen. Two out. character. They both are, really. Neither really showing much emotion. contact on the red, got it. Very good. Now she's opened up chances. and that will give her a chance to get the treble she needs. know, oh no! I don't think it really matters too much. Not a disaster. the bowl off. I agree. Fourth shot looks like red, slightly. we are definitely going to a tie-break. Not far away. she gets the red bowl absolutely clean... And then she has a chance. out for three, for the title. I think she's giving this a shot. expensive now. The game before last. Yes. becomes quite aggressive. Ellen is off to a good start. A deep bowl going N I can't blame her on that. She has one anyway. very close. Yes. Very close. Oh, has he got it? I think he has. Well-played, perfect. One red. Good bowl. Played with nice weight. bowl clean, well, she will be very happy. Quite a wide target here. Good chance of getting a result here. wouldn't have had second shot but she only needs one. Ellen's choice on who takes the jack, so she is given it to Martin. jack in the ditch. So drawn away, second bowl. backhand I think she's on a good line. Close with this. or draw it off. Percentages are on the weight shot. anything more, could we? No, we've had some unbelievable games. And one more, I'm sure, to come tomorrow. answer ready. I've got it ready already. understand Martin is reaching at this. Doesn't want a drop shot. Well, that's exactly where he needed to be. calm looking. Yes. Played it well. Played the rink well. think he has to go for this. Depends where this finishes from Ellen. quite sure whether that was necessary. Not bad. Second shot. Ellen Ryan. There is the smile there is the thumbs up. see these player up here and she arrived here and put the work in. Bert and hold of the title for the fifth time. -- better and better. the tournament. I had a couple of meetings with pau. We were chatting. man at the moment. In the list of all-time greats where does he rank? as equal favourite maybe with Greg and Alex and he will enjoy that. Davis Cup, Canada against Great Britain. BBC Two on Friday. Rishi Persad presents live coverage of the World Indoor Singles Final from the Potters Leisure Resort in Norfolk. 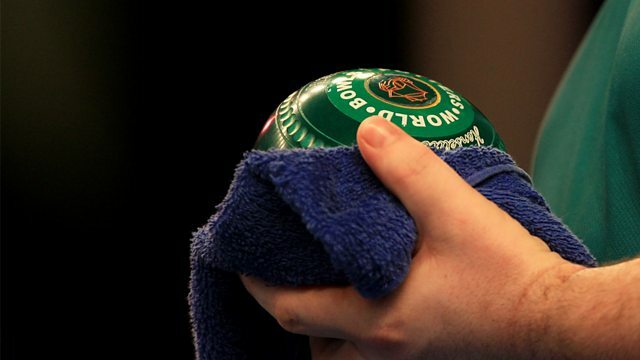 The most prestigious title in world bowls has been claimed by the greatest players in the game including Paul Foster, David Bryant, Tony Allcock, Richard Corsie and Andy Thomson. There were emotional scenes on the rink at Hopton-On-Sea 12 months ago as Nicky Brett from Cambridgeshire claimed the title for the first time. The finalists will be eager to join the illustrious roll of honour. With commentary by David Corkill.